In that odd way that only people who have worked around a hospital can appreciate, I have found the fact that Trinity Sunday coinciding with Memorial Day Weekend (Or, as I like to call it, "Opening day of major trauma season,")--rather amusing. I've got a confession. I find thinking about the Trinity too long, rather traumatic. My clergy Facebook friends find preaching about the Trinity on Trinity Sunday rather traumatic. Most of them refer in some way that it is a week where they feel compelled to teach those in the pews about the Trinity, and have to admit they really don't understand much about the Trinity. Now, I can handle the diagram above. It's pretty straightforward and simple. I recognize God is in all three entities, and each of the three entities are not in each other--well...sorta. One person told me in a recent discussion, "I know I'm not my brother and I know I'm not my sister, but the family DNA is in all of us." That is kind of what the diagram parallels. I agree with all of that. But that's where it ends. I have this nagging feeling that the Trinity is a representational being--like the wave or particle theory of light. Although I would be the first to tell you that the Trinity and the statements in the Nicene Creed (well, except for that add-on about proceeding from the Father AND the Son--the Son half of the filioque was tacked on later to the Creed) are "true," I would tell you I think the reality lies behind the Trinity, and the Trinity is what we use to explain what is actually a single entity made of infinite parts. Light, in some ways, behaves like a wave. In other ways, it behaves like a particle. Odds on, it's something that is neither or both a wave or a particle. But we can function in our world, make great discoveries and inventions involving the spectrum of light, by acting like it is a wave when it's useful and convenient, and acting like it's a particle when it's useful and convenient. The fact that it probably is NOT exactly what we theorize it to be isn't relevant. We don't sit and bemoan that it's not "true." Truth is perception, more than anything. But the fact that the Hebrew Bible has between 40 and 70 words (depending on which rabbi you consult) that describe one aspect of what Christians attribute to a function of the Holy Spirit, or God the Father, or the Messiah, makes me suspicious that the Trinity is to Christian thought what the wave or particle theory is to light--a representation we can wrap our brains around, at least to a basic degree, that allow us to be connected relationally to God, and not just function in that world, but imagine, invent, and share with others in community. Did you ever notice humans, by and large, no matter what their culture, like "threes?" We like to think bad news comes in threes. We tend to use threes in literature, in our phraseology. Many things in science, if you repeat them three times, creates a greater than two standard deviations level of confidence, statistically. We tend to only start to "get" things after the third time we've experienced something. We say, "three's a charm." I used to think that was a function of Judeo-Christian culture, until I learned that many other religions--Hinduism, Buddhism, Paganism, ancient Celtic religion, ancient Norse religion, etc.--also have many examples of the significance of the number three. My theory--and that's all it is--is that for some reason, humans brains are hard-wired to be ok with three. Maybe it is because it's simply one more than what we can grasp in our own two hands. It's manageable. So when the Trinity was being "figured out," people like the folks who came up with the Nicene Creed sat there pondering this God with infinite faces and forms, and gravitated to explaining it in an iconic representation that is the default human level of understanding--three. 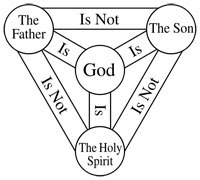 So for me, the Trinity is simply a three-pronged representation of an infinite concept--and here is where some people are going to shove me into the Express Lane to Hell for saying this, but I'm going to say it anyway--the Trinity seems to me to be more of a functional theory than an actual fact. There is truth in it, but the truth actually lies BEHIND it, not IN it, and I am willing to accept the "model" because it allows me to function in my world of "understanding my relationship with God." To accept the Trinity as "truth" also means I must accept the mystery that it is a representation of a bigger reality that I cannot possibly understand. It's why I don't trust anyone who claims he/she can "explain" the Trinity to me. I think part of accepting the truth of the Trinity is to also accept that my brain, in my living human form, cannot possibly understand it, but I can understand enough of it to function as one of God's children within the confines of what it represents. To say "I believe in the Trinity"--to say the Nicene Creed and mean what I say--means I believe the reality it represents is only fully fathomable in the next world. I'll be honest--this is a hard realization for me. I like to think I'm smart enough to "figure most everything out." But to accept that I cannot possibly figure this one out, is to accept another part of my life as a child of God--faith. Faith that this representation can take me everywhere I need to go, to live in service to God--and in that, I believe.